Political processes of Hugo Chavez in the Bolivarian Republic of Venezuela, Rafael Correa in the Republic of Ecuador and Evo Morales in the Republic of Bolivia are linked in this paper considering their ideology, strategies and discourses. 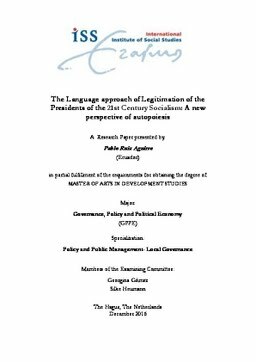 This study analyses what is the language approach of legitimacy for each of the representatives of the new Latin American Left through their inaugural speeches. This study also proposes a toolkit and a new methodology of discourse analysis based on framing, myth and legitimation to understand these speeches and the usefulness of autopoiesis as a new concept to recognise the discourse. The analysis shows that the general frame in the Latin American new Left discourse is based in cultural resonance and a problem-solution logic as part of substantive and procedural framing. Moreover, the study shows that this discourse has a multidimensional legitimation and that it uses myth as a regular tool to support the speech. Finally, this study uses autopoiesis to respond to the research question, as a new perspective applied to discourse which is treated as a living system, to comprehend the unceasing framing of “myth making” in order to legitimate initial discourses of Presidents Morales, Chavez and Correa. Thesis Advisor Gómez, Georgina M.